Quick Summary for You: Robust and sturdy but lightweight so easy to throw in your bag for use anytime, anywhere. Lovely spout to drink from and easy to take apart and wash. The clear edition allows you to see your drink too. 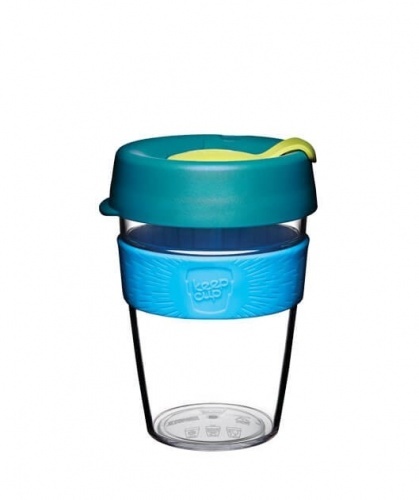 KeepCup is a reusable cup that you can use for coffee, tea or any drink, either at home or on the go. Its easy to use, easy to clean, its also leak proof and has an easy pour spout. KeepCup Original is the world’s first barista standard reusable cup. Made from lightweight plastic its unbreakable and colourful – an easy choice for coffee on the go. The Clear Edition is the original design, but made from resilient clear plastic, perfect for your favourite hot or cold beverage on the go. Durable and lightweight with the clarity of glass. Grab your favourite colour and style today and next time you order your favourite coffee on the go - ask them to use your KeepCup instead - lots of cafes are now charging less if you do! Around 5 million people around the world already use a KeepCup, diverting millions of disposable cups daily from landfill and through their actions, inspire others to do the same. Join the revolution, get a reusable KeepCup, water bottle and shopping bag and start making a daily difference. KeepCups have been tested to 1,500 uses by industrial designers. We estimate they will last at least three years. What is the problem with disposable cups? Whilst disposable cups are marketed as ‘paper‘, they are commonly lined with polyethylene which contaminates the recycling stream and have polystyrene lids. They help to promote a throwaway culture of one-time use. Minutes in your hand, up to 50 years in landfill. Even Compostable and biodegradable paper cups cannot be put into household compost, they have to be commercially recycled. Buy a KeepCup and promote a larger movement of reuse and sustainability. KeepCups are fully recyclable. you can put the separated components in household recycling at the end of life. What else makes KeepCup good for the environment? The resources required to manufacture plastic are relatively low. This means you only have to use it 15 times to break even with a disposable cup in terms of the energy manufacture and use. The KeepCup is made from single component materials to facilitate recycling at end of life. Polypropylene is being targeted as a great material capable of being recycled into consumer goods. There are lots of clever people doing exciting things in this space. Being lightweight and stackable has a significant impact on the environmental costs of shipping and freight. The ability to ship components for local assembly also decreases the environmental impact of the KeepCup. For you to carry our product around it has to be lightweight, ergonomic and unbreakable. The ability to choose a unique, personal colourway for yourself increases the desirability of the KeepCup, and increases your likelihood of remembering and reusing. Over one year the KeepCup, when compared to disposable cups, reduces landfill by at least 99%, reduces water use by up to 90% and reduces greenhouse gas emissions by up to 92%. Over 500 billion disposable cups are manufactured globally every year. Half of the plastic used in the world today is for single use disposable items like bottles, cups and straws. Most of the world’s paper supply, in fact about 71%, still comes from diminishing forests, not tree farms or the recycling bin. Available in a range of colours and styles to suit all tastes and travels. I prefer the glass KeepCup to the plastic ones as I feel sometimes that I can get a taste from the plastic ones. I do know that that is just me. Both handy & stylish & everytime you use it you are using one less plastic cup. Fast delivery so would buy again.